2 more FREE items from NMR at 12 noon EST today! Sign up now if you aren’t already and be ready to snag these deals!Â They go very quickly!! Burger King – FREE FRIES today only! Burger King is giving away FREE FRIES to everyone today, Friday, December 16th! No purchase necessary! Signup to get a Free Year of Cosmo Magazine! (Digital)Â Enjoy 12 digital issues (starting with the January 2012 issue). No strings attached. You’ll never receive a bill. Mobile Ready: Read on your iPad, iPhone, Mac, and PC! Modern women look to Cosmopolitan magazine for fashion, beauty, relationship advice and celebrity news. Cosmopolitan magazine always has the latest and hottest dish on your favorite stars, raciest relationship confessionals and tips, and the Cosmo quiz! Don’t miss a single issue — subscribe now! This subscription was purchased on your behalf by JewelMint.com. 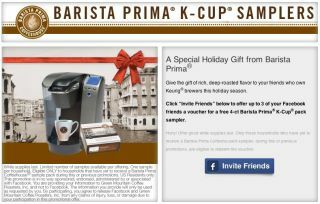 Become a fan of Barista Prima Coffeehouse on Facebook, and you can send a FREE sample of Barista Prima K-Cups to up to three friends! FREE sample of Schiff MegaRed Softgels! Become a fan of Schiff MegaRed on Facebook and you can score a FREE sample of Schiff MegaRed Softgels!